Planned coal capacity is down 84% on 2015. Coal is widely acknowledged as one of the most polluting ways to generate electricity. The International Energy Agency (IEA) calculates that this one fuel alone has been responsible for a third of all global warming in modern times. So, the news that the amount of planned new coal-fired generating plants reached a new low last year must be good for the planet. The amount of planned capacity fell by over a third last year and was 84% down on the figure for 2015. But although fewer new coal-fired power stations are being planned, those already approved are still being built. Global Energy Monitor says there was a 12% increase in the amount of coal-fired capacity under construction last year. And the IEA reported this week that coal usage rose last year for the second year in a row, reversing two years of decline up to 2016 and contributing to a 1.7% increase in CO2 emissions. Two-thirds of new coal-fired capacity coming online last year was in China and almost a fifth was in India. Indonesia, Japan, Pakistan, the Philippines, South Africa, Turkey and Vietnam also increased coal burning capacity in 2018. Paradoxically, despite using more coal, China also achieved the world’s biggest increase in solar and wind generation last year. Renewables now account for more than a quarter of world power generation, and last year they delivered close to half of the growth in global capacity. 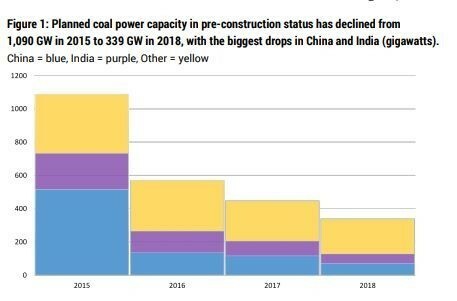 The amount of coal-based capacity closed down last year was almost equivalent to China’s capacity growth which meant the growth rate of coal capacity slowed to the lowest on record, the fourth straight year of decline. The US led the way, shutting down 18 gigawatts of capacity. India and China both plan large scale closedowns in coming years. Over half of EU member states have committed to phase out coal by 2030. In the UK, coal provides just 5% of capacity, down from two-fifths six years ago. Disappointing as it was, last year's 0.7% increase in coal use was much slower than the 4.5% annual rate in the decade to 2010. But coal still remains the largest source of global power generation and the second largest source of primary energy. The World Economic Forum’s 2019 Fostering Effective Energy Transition Report found that the pace of the world's transition towards clean energy had slowed to the lowest rate for five years, with investment in clean energy down by almost 10% last year.